'I Don't Have Time For [Whatever]!' OK, Time For PPC. If you had a minute back of your life for every time you said, "I don't have time to for [whatever]," you'd be kicking it in your crib (the baby kind), living the good life! Seriously, we all do it. Someone asks us if we are doing this, that or the other thing with our business, and we reply, "I would if I had time." or "I wish we were, but my staff and I just don't have the time." If we stop and truly reflect on that response, more often than not, we couldn't look ourselves in the eyes and say it truthfully. Often, it's simply our go-to response for something we know we should do but we haven't put in the effort to get to the bottom of what it will take to do it, or we just don't feel like dealing with it right now. 1. 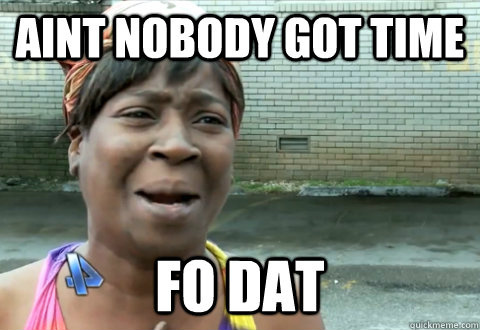 Content Marketing - "Ain't Nobody Got Time For That!" Again, you're probably wrong if you think you don't have time for it. It's a great way to educate your buyers, set the buying criteria, and get loads of FREE traffic at the same time. 2. Social Media - "Ain't Nobody Got Time... Ain't Nobody Got Time... Ain't Nobody Got Time For That!" Do you use social media personally? Have a Facebook account? Yep, you probably have time that too. 3. Email Marketing - No! Time! Liar, Liar, pants on fire. It's cool though. PPC is one of those web marketing tactics that requires very little time from a business (if managed by an agency), and can produce immediate, measurable results. You don't have to know how it works to take full advantage of PPC. After an initial meeting or conference call, we can get to work setting up your accounts and funneling high-quality traffic to your website. It's very fast, takes little effort from a business owner or staff and produces fairly consistent and positive results. What's the downside? Unlike the tactics you don't have time for, this one requires you to invest money rather than time, and when the money investment stops, so do the results. In business time = money anyways, so you are spending either way. With the tactics you don't have time for, the effects of them can lead to ongoing quality traffic/leads/sales without any additional time/money. If you are in a position where you want your website to start generating leads/sales for you, but you don't have time for [whatever], PPC is one of your best bets! Give us a shout to talk more about how Pay-Per-Click would work for your business.